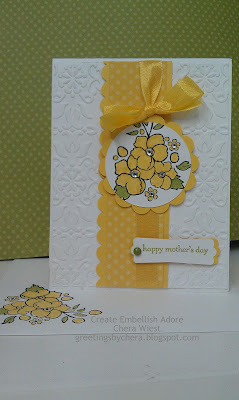 Create Embellish Adore: Happy Mothers Day! says the disappearance of this card from my cave will be because my daughter snuck it out for her and her brother to use for today....any takers??? How would I know this... because SHE recommended using the Daffodil delight when I completed the Coral card... yeah, I am on to her!!! Thats the best part of making cards... you rarely make cards you wouldn't want to receive yourself. I just get to be lucky enough to receive one! ha ha. even if that is nothing!!! Now that is too funny!!! Is that the card you received?